Here you can find a collection of printables for the unusual flag of Brazil. The National flag of Brazil was adopted in November 1889. On the flag you can see a blue circle containing 27 stars, each representing a separate state, on top of a yellow rhombus, lying in the centre of a green base. Amazingly, the stars on the flag represent the night sky at the time the flag was designed and adopted! The green and yellow colours represent the reigning House of Braganza and the house of the first Emperor, Habsburg. The motto portrayed on the flag, "Ordem e Pregresso" means "Order and Progress". Print and fold this little booklet for Brazil, following the instructions here. Use these Brazil bookmarks as little prizes in class or give out at the end of a successful studying session! Or use them to mark places in your atlas. There are various versions available to print, in colour or black and white, and with or without words. Enjoy colouring in the fantastic and unusual flag of Brazil! Flag jigsaws are a great way for younger children to get an introduction to geography. Use one of our jigsaw templates to make the flag of Brazil, and then locate it on a globe or map. Our flag printables are great for making bunting, flags to wave during the World Cup or to use in your school work. 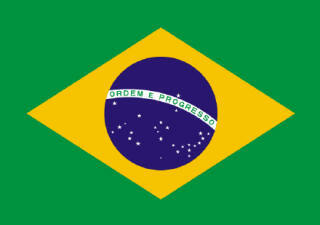 Here's the flag of Brazil! If you are interested in Brazil, then why not use this notebooking page to record interesting facts. If you don't plan to do any drawing you could print out the lined only version.